Carol grew up in rural Tennessee, which you will know when you hear her southern accent. She met her husband Michael in college at Carson-Newman University in east Tennessee. 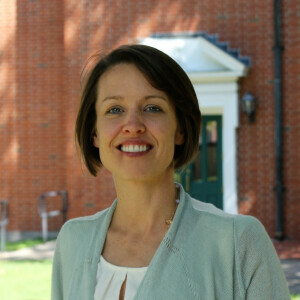 She has a bachelor of arts degree in psychology and human services from Carson Newman. She attended seminary at Baylor University in Waco, Texas where she earned a master of divinity and a master of social work. Carol is currently working on her doctorate of ministry in Worship, Preaching and Spirituality at Drew University in New Jersey. Away from the First Baptist Church family, Carol enjoys walking the trails in Columbia, cooking for her family, traveling to new places (20 countries so far), and reading (mostly church stuff, like N.T. Wright, Brian McLaren and Walter Brueggemann). Carol and Michael have two children, Nate (7); and Marin (2). They bring a great deal of joy and messiness to her life.